Successfully Added Wachtmeister - CCTV Security Camera with SONY Interline CCD to your Shopping Cart. 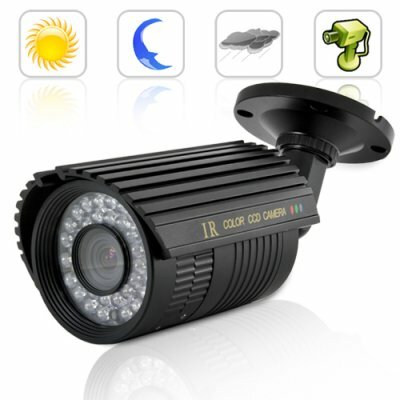 Waterproof Night Vision CCTV Security Camera with Sony CCD video sensor. Protect your home or business with this durable, high-quality outdoor surveillance camera with a Varifocal Lens, 36 IR LED's and advanced Sony CCD. Anyone concerned about security will appreciate this durable, high-quality wired security camera. The Wachtmeister provides super clear resolution of 520TV lines along with a long viewing range day and night, making this powerful camera perfect for keeping an eye on the outside of your home or business all day and night, rain or shine. The 1/3 inch CCD Sony lens gives a high quality image and wide viewing angle, while 36 infrared (IR) LED's provide excellent night vision, even in complete darkness. The J24 comes with a focal length and zoom adjustment lever. Further more, the heavy-duty aluminum casing protects this camera from water, stormy weather, falling debris, and even vandalism. The Sony Interline CCD gives you a better image than other security cameras, because Interline CCD means that the quantum efficiency (QE) is increased, allowing more light to reach the CCD for extra image clarity along with noise reduction, thus further improving the quality of the image, especially in low light environments. With the integral die-cast arm + mounting bracket, installing and positioning this camera exactly where you want it is easier and more secure than in any surveillance camera you have ever seen before! Plus, the heavy gauge metal mounting plate has four perfectly placed holes to assure a secure mounting for surface or suspended installations, making this model ideal for flat, angled or even texture mounting surfaces. We know what you must be thinking, "shouldn't a CCTV Security Camera this good be selling for at least $300?" You are right! However, with the exclusive Wachtmeister CCTV security camera, you are getting the same quality the Chinese Police and German Military use, but at a low factory-direct wholesale price. For maximum home and business security Start the New Year with increased security and complete peace of mind, the CVJZ-J24 is proudly brought to you by - Chinavasion. Does this camera have audio? No. This camera captures video but not audio. No. This camera has a light sensor that detects light levels. It switches to IR mode automatically. Do you connect cables from the camera outside to your computer or is it cordless? This is a CCTV surveillance camera, meaning it is not wireless/cordless. You will need to connect cables from the camera to a computer, monitor, DVR or TV screen.